Indonesia is known as the largest archipelago country in the world, with an area of 1,904,569 km2 and the number of islands at least 17,508. Indonesia lies on the equator and belongs to Southeast Asia, flanked by two continents, Asia and Australia and two oceans, the Pacific and the Indies. Therefore, Indonesia is also called Nusantara. With a population of 258,316,051 people (based on July 2016 data), Indonesia is the fourth most populous country in the world. Among the islands, there are only several islands that are populated. There are 10 most populated islands in Indonesia. They are Java, Sumatra, Kalimantan (Borneo), Sulawesi or known as Celebes, Papua, and other small islands that has many inhabitants. However, there are just some islands that have big population. Here are the list of most populated island in Indonesia. 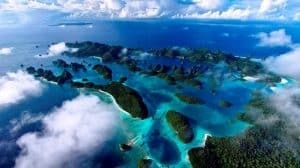 This is the most popular island in Indonesia with 30.777km2 width. The island is located at Coordinate 7 ° 30’10 “LS, 111 ° 15’47” BT. This island is the island with the densest population in Indonesia with a population of about 124 million inhabitants. There are 6 Provinces such as: DKI Jakarta, Banten, West Java, Central Java, Yogyakarta, and East Java. The population of this island is 139,448,718 people. It means that the rate of density is 1,117 people /km2. However, the highest population number in this island is Jakarta. To see more about Java, you could read History of Javanese Language. The island is located at coordinates 0 ° 00 ‘LU 102 ° 00’ BT. It is about 425000 Km2. There are 8 Provinces isn this island: Aceh, North Sumatra, Riau, Jambi, Bengkulu, West Sumatra, South Sumatra, and Lampung. The inhabitants of this island are about 47,010,000 inhabitants (2010). In Sumatra there was a kingdom of Samudera Pasai (now Aceh). It is said that on his visit to the island, Ibn Batutah (Islamic scholar from Morocco) always pronounced the word Samudera into Sumatra, since then the name of Sumatra is widely known as the name of the island. Besides known as Sumatra, the island is known by the name of Andalas island or also Suwarnadwipa. Suwarnadwipa means “Golden island”. The Negarakertagama manuscript of the 14th century mentions “Earth Malayu” for this island. With an area of 174,600Km², the island is located at Coordinate 2 ° 08 ‘LS 120 ° 17’ BT. The island has 8 Provinces: Gorontalo, North Sulawesi, West Sulawesi, Central Sulawesi, Southeast Sulawesi, South Sulawesi. The population in this country reaches 17,371,783 (2010). Sulawesi is the name of the island in Indonesia which is in the middle of the Maluku Islands and the island of Borneo. Having an area of about 174,600 sq km, Sulawesi is the 11th largest archipelago in the world. In Indonesia, the area of Sulawesi Island is ranked 4th after Papua, Kalimantan and Sumatra. In English, the old name for Sulawesi is Celebes. The name Celebes for the name of Sulawesi first used was the Portuguese. Borneo is an island located on the north of Java Island and on the West of Sulawesi Island. This island is divided into Brunei, Indonesia, and Malaysia. It is located at coordinates 1 ° 00 ‘LU 114 ° 00’ BT. This is the largest island in Indonesia (743.330 km ²) with a population of 15,320,017 people (2015). Often the island as a whole is called Borneo while the Indonesian territory is called Borneo, then Malaysia is called Sarawak and Sabah. In addition there is also the Sultanate of Brunei. In ancient times, Borneo was the name used by British and Dutch colonials, while the name of the island of Borneo was used by Indonesians. In earlier Indonesian, North Borneo was the name for North Borneo (Sabah), but in the present sense North Kalimantan is the northern part of East Kalimantan. With the area of 777,000 km², the population of the island amounted to 4,363,869 people (2014). The island is divided into two regions of which the western part is controlled by Indonesia and the eastern part is the state of Papua New Guinea. The island is located at coordinates 5 ° 20’S 141 ° 36’E. The term “Papua” is used to refer to the island as a whole. New Guinea is derived from the word New Guinea, a name given by Westerners, who are in-Indonesia. They used to argue that the land of Papua is like Guinea, a region of Africa. So they call the new Guinea. The term “Papua” is now also used to refer to provinces in western Papua which are controlled by Indonesia, namely Papua and West Papua. On this island is located the highest mountain in Indonesia, namely Puncak Jaya (530 m). Bali is the sixth island with the densest population in Indonesia. With an area of ​​5,636.66 square km, the population of the island of Bali totals 4,200,100 people (2015). Geographically, Bali is located between Java Island and Lombok Island. The majority of Bali’s population is Hindus. In the world, Bali is well known as a tourism destination with its unique art-culture variety, especially for Japanese and Australian tourists. Bali is also known by the nickname of the Island of the Gods and Pulau Seribu Pura. Madura is the name of the island located in the northeast of East Java. Madura Island is approximately 5,168 km2 (smaller than the island of Bali), with a population of nearly 4 million. Suramadu National Bridge is the main entrance to Madura, in addition to this island can be traversed from the sea or through the air. Madura Island looks like a cow body, consisting of four districts, namely: Bangkalan, Sampang, Pamekasan and Sumenep. Madura Island inhabited by Madurese tribe is one of the ethnic tribes with a large population in Indonesia, the number of about 20 million people scattered in Indonesia. The island of Lombok with a population 3,160,000 and vast is an island in the Lesser Sunda Islands or Nusa Tenggara is separated by the Lombok Strait from Bali in western and the Alas Strait to the east of Sumbawa The island is more or less round with a kind of “tail” on the southwestern side of which is approximately 70 km length. The area of the island reaches 5,435 km² that plcaes it at the rank of 108 from the list of islands based on the extent in the world. The capital city on the island is Mataram City. Timor is an island in the southern part of the archipelago, divided between the independent state of East Timor and the West Timor region, part of the province of East Nusa Tenggara in Indonesia. The total area of Timor Island is about 30,777 km² with a population of 2,016,451 people. The name of this island is taken from the word ‘east’, Malay for “east”; so named because it lies at the eastern end of the chain of islands. Flores, from Portuguese meaning “flower” is in East Nusa Tenggara Province, Indonesia. Flores belongs to the small Sunda Islands with Bali and NTB, with an area of approximately 14,300 km² with a population of 1,831,000 (2010). Flores Island with Timor Island, Sumba Island and Alor Islands are the four major islands in NTT Province which is one of the archipelago provinces in Indonesia with 566 islands.